Thousands of Hollywood writers are firing their agents after failed negotiations. The writers belong to the Writers Guild of America. 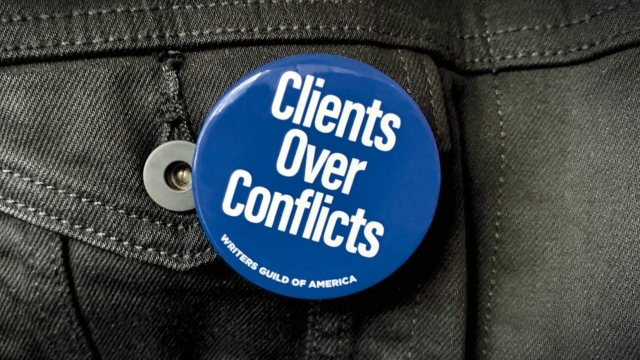 The guild is a labor union that represents film, TV and new media writers in negotiations. Usually those talks are with production studios, but this time, it was with a group that represents the major talent agencies. Until now, the working relationship between agents and writers was based on a 1976 agreement. That deal expired Saturday, giving the guild a chance to negotiate a better agreement for writers. So, this was the situation: An agent's job was to find work for their client mediating between writers and studios. The agent's fee was almost always a percentage of the writer's pay — usually 10% — which is incentive for the agency to negotiate higher pay for the writer. The recent disagreements stem from deviations in that system, which the Writer's Guild says create conflicts of interest. One complaint is that the agents have increasingly started packaging talent in agreements. The agency gets a packaging fee from the studio but doesn't get the 10% of the writer's pay. Essentially, the agencies pocket more money, while the writer gets less. Another disagreement has to do with agencies starting their own production companies. According to the Writers Guild, this creates a major conflict of interest because the agents can also then be a writer's employer. It gives an agent the incentive to negotiate lower pay for a writer to save the agency money. During negotiations with the Writers Guild, the agencies offered to be more transparent but refused to end the packaging fees or production programs. Since the parties reached an impasse, the 13,000 union members were instructed to sign letters firing their agents. As Hollywood approaches its usual hiring season, the labor union told writers to use its online job portal, lawyers or managers instead of agents.